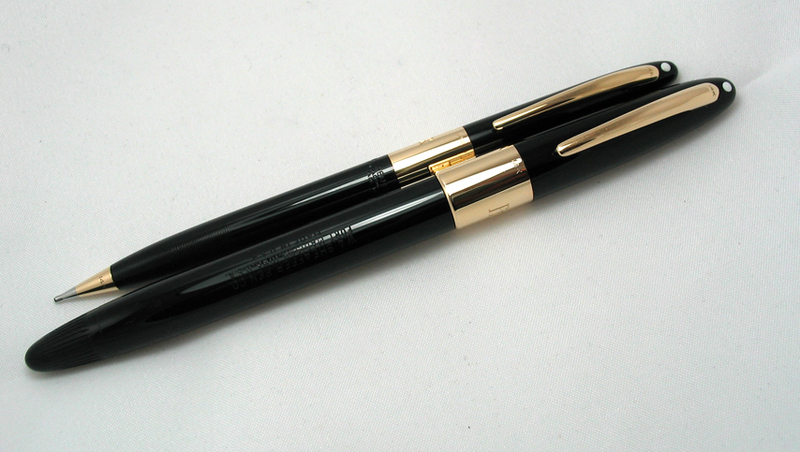 A Sheaffer Tuckaway Autograph set. 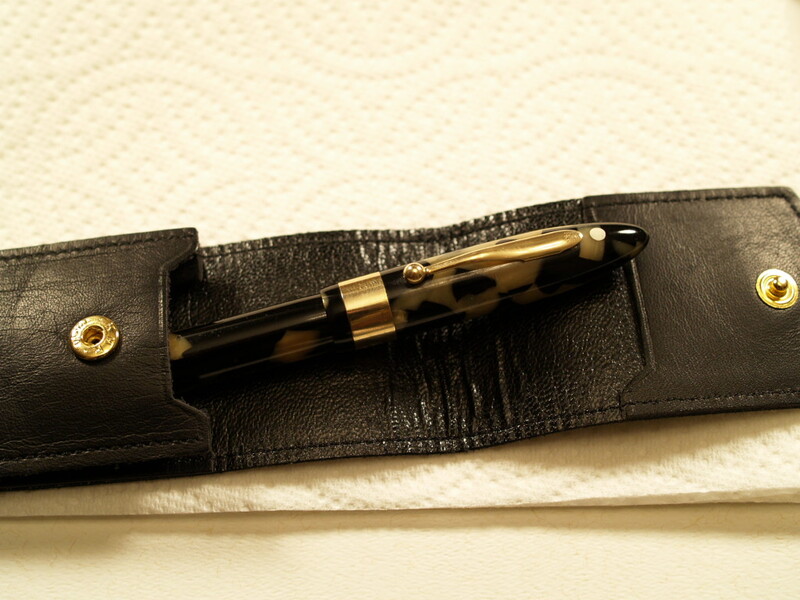 Sheaffer Military capped Autograph...... The Service Autograph. Edited by jaytaylor, 13 January 2007 - 06:08. I have a Snorkel Autograph (not actually autographed), which I love. Wonderful photos - thank you! Beautifull Autograph collection, congratulations ! I equally have an Autograph snorkel & an 1750 vac-fill set, these are within my favourites. Seeing your collection surely increases my appetite, please stop showing these beautifull pens, the contains of my wallet actually not permits to buy me these ! Edited by fountainbel, 14 November 2006 - 11:28. Well, my picture isn't going to be that nice but this is a Senior Marine Green Autograph with a factory clip that's been mis-applied. Everything is tight though and the pen looks uninked though it was very lightly used at one time. The color is much better than the pic shows. S.T. Dupont fan! write right, all right? I have this one on the way. minor scratches on the cap and barrel that should buff out nicely. that tuckaway set is beyond awesome! i didn't know those even existed in the 'Autograph' trim! 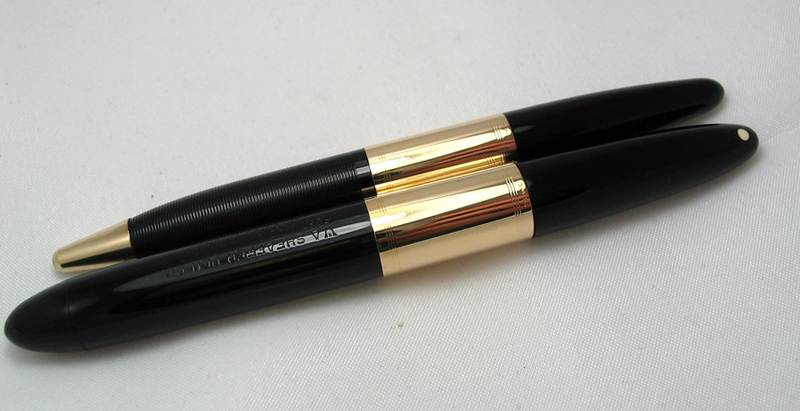 Y'all have probably seen this one before, but it's the only picture of a 14K-trim Sheaffer that I have handy. I'll shoot some others when I get a chance. Hi Daniel. I really like the photo setup on that one. I'll borrow it for my next one. 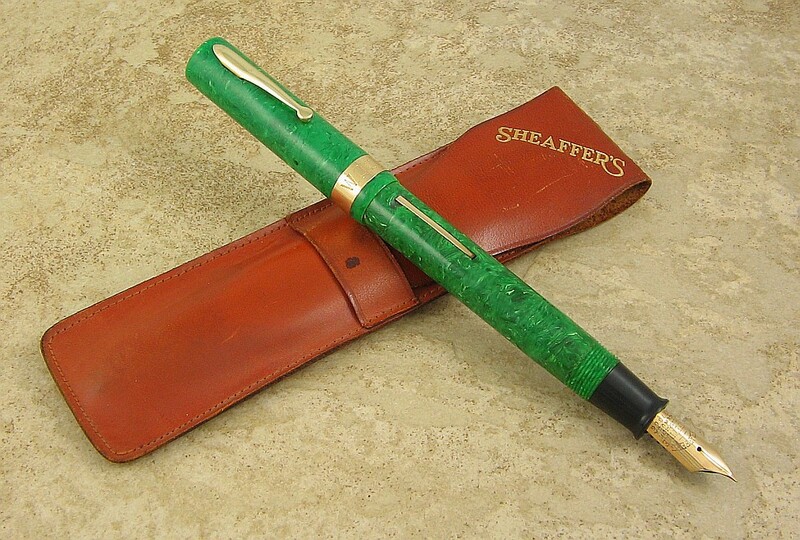 man, i haven't been a fan of green pens, but i'd make an exception for that one. stunning! and speaking of stunning, look at the splashes of color on that one! really cool! This next picture is a 1918 #8 Black Hard Rubber Autograph. The cap, nib, early feed and section are all excellent. The original barrel is just ok so a 1924 Radite model is standing in until a nice rubber one can be found. 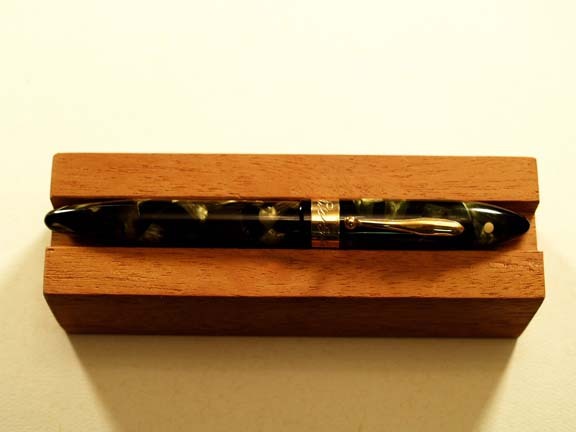 This pen is what most would call the rarest of all the Autograph pens. 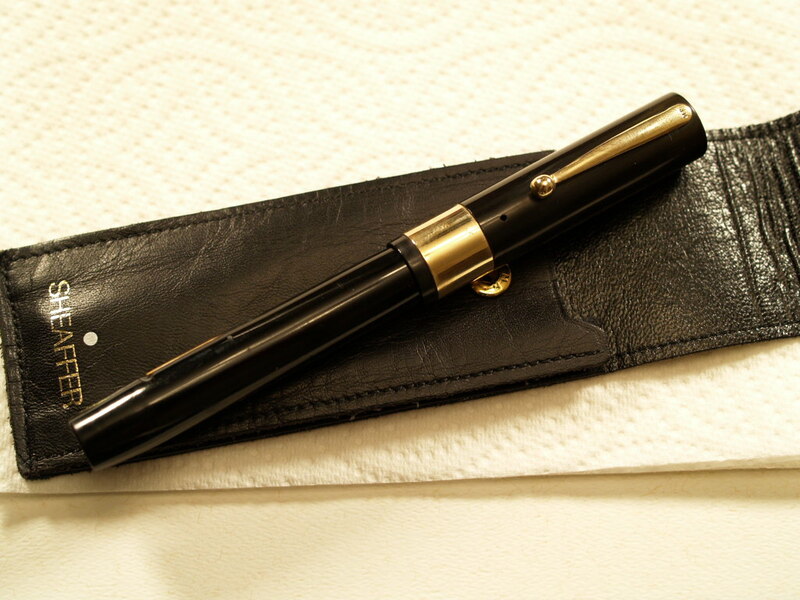 As for the next suspect, this one is a Full Size Balance Autograph in Black and Pearl dating from 1933 or 1934. Near mint condition with mild discoloration of the barrel. 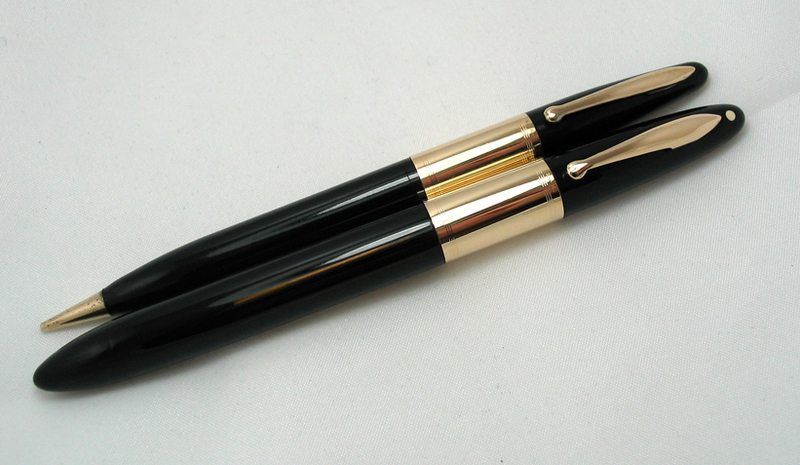 Two tone nib. yikes! a BHR model? Man, that thing is beautiful!